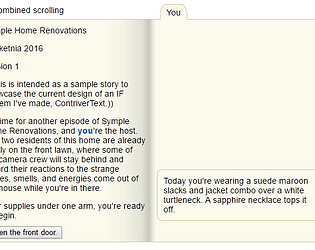 ContriverText is an interactive fiction engine I'm designing to try to retain the good parts of Seltani's interface while smoothing over some awkward parts and missing pieces. 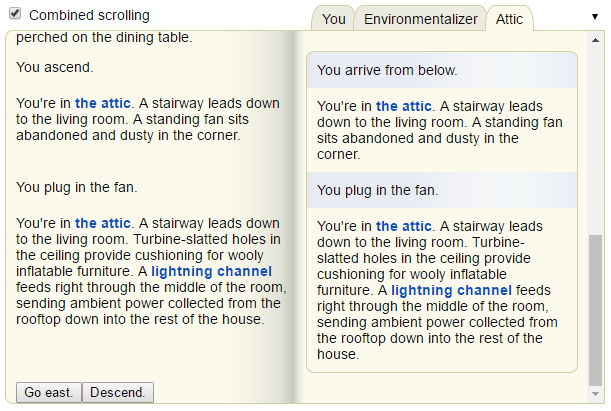 Unlike Seltani, ContriverText keeps a scrollback of every room description, examined description, and event you've seen, and they're all in a top-to-bottom chronological order. ContriverText also commits to using distinct styling for links that lead to more information and buttons that cause actions. Actions are always at the very bottom of the scrollback, since they represent potential futures. 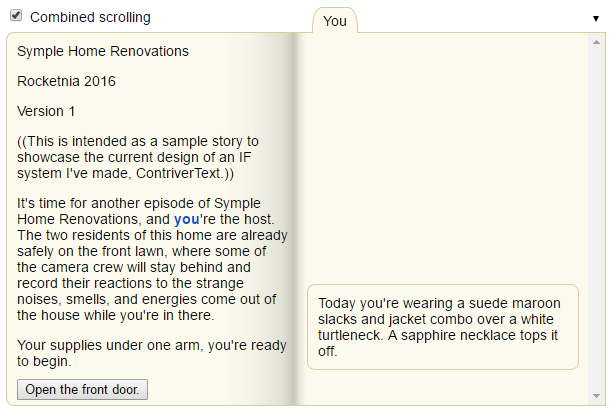 No matter how I try to display examined topics in a separate column from the primary narration, there's something I find tacky about it, like the way it shifts around when the player examines a new topic. I expect to do a substantial redesign to fix this, possibly by treating examination as an action the way parser IF does. If I make a substantial change like that, it'll affect what stories ContriverText can tell, so this old design will be "dead." I'll still be very interested if anyone has feedback on this version of the design, so I'm grateful for all who give it a try. This actual story here is something short and quick that I could write for this jam. Hopefully it's a good representative of ContriverText's features.